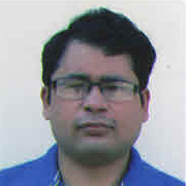 Anshu Pandey, Solid State and Structural Chemistry Unit, IISc, Bengaluru, selected to Associateship in 2014. He received his PhD from University of Chicago in Chemistry in 2009. Pandey’s research interests include spectroscopy and synthesis of semiconductor and metal nanocrystals. The formation of charge transfer states in a binary quantum dot (QD) mixture will be demonstrated. Charge is observed to reside in quantum confined states of one of the participating QDs. Charge transfer gives rise to electrostatic forces between QD pairs, leading to materials that may be regarded as the nanoscale analogs of an ionic solid. These solids are shown to lack crystalline order, but exhibit a well-defined stoichiometry. The formation mechanisms of these materials and the reasons behind the emergence of atom-like characteristics in QDs will be described. Finally, various examples of chemical reactions between QDs will be provided and also the energetics of such reactions will be described.